Gastric Bypass Surgery, also known as Roux-en-Y (RNY), is recognized as a “Gold Standard” in the bariatric industry. RNY gastric bypass is a more aggressive procedure than gastric sleeve. However, like gastric sleeve, it changes the body’s set-point (metabolic thermostat) that induces rapid, effective, and long-term weight loss. The bypass surgery works using two methods (or components), called Restriction and Malabsorption. These two components work together creating one of the most powerful combinations in curing obesity. Restriction – The Restrictive Component is achieved by surgically forming an “egg-sized” stomach pouch, called the stoma. The new smaller stomach holds about two ounces of food (average stomach capacity of 40 ounces). This restrictive component is similar to the one in gastric sleeve and lap band surgery. Cutting the big portion of the stomach also reduces the level of hunger hormones (Ghrelin) which causes patients to feel fuller with smaller amounts of food. Malabsorption – The Malabsorptive component is achieved by rerouting a section of the small intestine. When the small intestines are “bypassed” a significant portion of consumed nutrients and food do not get absorbed. Through malabsorption, gastric bypass surgery allows food to pass through the digestive system quickly which reduces the number of calories absorbed into the bloodstream. Mexico Bariatric Center® offers Mexico gastric bypass surgery with some of the most trusted, board-certified surgeons in Tijuana. Am I Eligible for Gastric Bypass Surgery? Be between the age of 18 to 62. Need to have tried losing weight with typical tactics without much success. Need to have realistic expectations regarding the result of the surgery. Need a BMI of more than 30 or with comorbidities. Other Considerations – Gastric bypass is better suited for patients with severe acid reflux and GERD. However, if you have ulcer problem or are taking Aspirin/Non-Steroidal Anti-Inflammatory Drugs (NSAIDs) on a regular basis, gastric sleeve or duodenal switch are better options for you. The reason for this is that there is no conventional routine to detect ulcer in the “stoma” or so-called “blind” stomach. MBC surgeons review each patient on their own to see if they could benefit from this weight loss surgery procedure. Bypass surgery is a more effective bariatric surgery than gastric balloon, lap band, and on some occasions than gastric sleeve surgery. After surgery, a majority of our patients lose most of their excess weight (averaging 70-80% excess weight loss %EWL) within the first two years. How Much Weight Will I Lose With Gastric Bypass Surgery? The RNY gastric bypass procedure takes about 2.0 to 2.5 hours from start to end. The actual operation takes about 60 min to 90 min, depending on the surgeon’s skills and experience. The patient is required to stay in the hospital for one to two nights, however, to ensure fewer complications, MBC keeps the bypass patients 3 nights in the hospital. Healing is fast and patients can return to work after two to four weeks following the surgery. Mexico Bariatric Center has helped thousands conquer their obesity by performing gastric bypass surgery in Mexico, changing patients lives forever. Besides rapid weight loss, another major benefit of gastric bypass surgery is that it is fully capable of reversing or improving the most severe comorbidities, which include type II diabetes, hypertension, high blood pressure, back pain, sleep apnea, depression, and many other obesity-related health problems. Gastric sleeve cost is high in the United State and Canada due to the high cost of healthcare, instrumentation/material, and hospital stay. The self-pay cost is normally over $20,000 with hospitals charging insurance companies over $60,000. The cost of sleeve surgery in Mexico is considerably lower in the range of $6,500 to $10,500. Tijuana offers one of the most affordable prices for bariatric surgery, including gastric bypass. Mexico Bariatric Center offers all-inclusive, affordable packages – which includes everything a patient needs pre and post surgery. MBC top-rated bariatric surgeons charge 1/3 less than their U.S. and Canada counterparts. Contact our helpful staff to see to get a personalized quote. [See Our Current Prices Now]. Is Gastric Bypass in Tijuana Safe? Fear of getting weight loss surgery in Mexico can be real if you are dealing with outdated hospitals and inexperienced surgeons. Safe gastric bypass surgery in Mexico is something we keep an eye on at MBC. We work with a closed network of hospital facilities, surgical teams, and staff to make sure patients feel relaxed and safe when they travel abroad for gastric bypass surgery. Gastric bypass is a safe procedure but like any other surgery, it has risks and side effects. Dumping Syndrome, for example, is common after gastric bypass surgery because food gets dumped directly from stomach to small intestine without being digested. Mexico Bariatric Center is one of the pioneering companies to offer gastric bypass surgery in Tijuana, Mexico. Undergoing gastric bypass surgery in Mexico with our qualified surgeons is a safe and smart move if you’re looking to have surgery done in a full-service, certified hospital that specializes in bariatric surgery. During the gastric bypass surgical procedure, the surgeon makes about 5 or 6 small incisions on the belly and inserts trocars (hollow tubes) through the incisions as a conduit for surgical instruments. The abdomen is inflated with carbon dioxide (CO2) gas for the surgeon to have room to maneuver with organs pushed aside gently. A laparoscope (probe equipped with a built-in camera) and other surgical instruments, including a retractor to lift the liver, can now be inserted into the abdominal cavity. The cutter/stapler (normally a product of Ethicon) is used to cut the stomach and staple the stomach at the same time. The stomach is divided up into two by the stapler: a much smaller upper part (called pouch) with a size of a golf ball and a larger lower part (called remnant pouch). 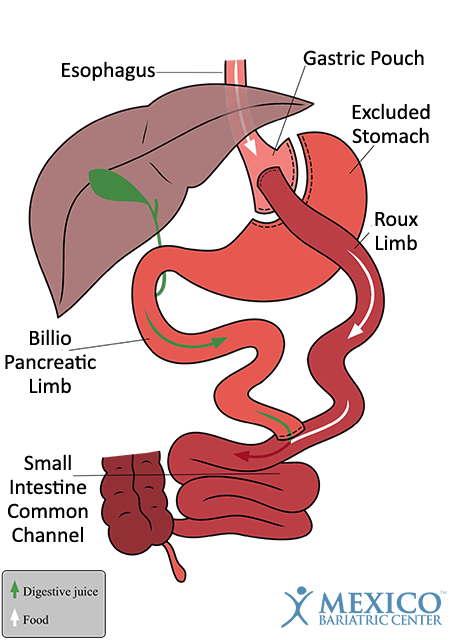 The small pouch receives food and the bottom part of the stomach no longer receive food – the gastric juices from this part pass into the intestine and mix with food. An outlet called a stoma is created in the small stomach pouch (the size of a dime). The surgeon divides the small intestine and re-arranges it into a Y-configuration. Then the upper small intestine (the duodenum) is connected to the new stomach pouch which is called the stoma. The rerouting component is complete when the bottom portion of the small intestine is then connected (after bypassing) to the jejunum which is further down the intestinal tract. Gastric Bypass, Roux en-Y (Proximal): Proximal or short-limb RNY is the standard procedure performed. The Y-connection is connected near the upper part (proximal) or first 10 centimeters of the gastrointestinal tract (small intestine). Gastric Bypass, Roux en-Y (Distal): In Distal Gastric Bypass or long-limb RNY, the Y-connection is connected further down the track about 100-cm (distal), allowing fewer nutrients to be absorbed. This increases the weight loss for the patient. In distal RNY, more of the small intestine is bypassed and there will be less intestinal surface for absorption of calories, especially fat. The patient will experience more frequent bowel movements per day. The consumed fat will be digested less and will be eliminated undigested. This may cause smelly and loose stools. Mini-Gastric Bypass Surgery: The mini-gastric bypass surgery is a simpler alternative to traditional gastric bypass procedure. It involves a long, tight stomach that connects to the digestive tract. The mini RNY procedure only uses one connection (single-anastomosis) through the small intestine, instead of two connections (double anastomosis) like regular RNY bypass. This is a minimally invasive and less complex process. Learn more about mini gastric bypass surgery or compare the differences between bariatric surgery types. Gastric Bypass Revision Surgery in Mexico: Patients who have already undergone gastric bypass surgery can choose a revision or another bariatric surgery. This can arise because of many different issues, including lack of sufficient weight loss. MBC surgeons are also experienced in revision of previous gastric bypass by open incision surgery. Learn more about gastric sleeve revision surgery in Mexico.